Glass Fuse 5x20mm, 8A Glass fuse 5x20 mm with an average time of interruption. Rated current 8 A, maximum working voltage 250 V and long life. Glass Fuse 5x20mm, 12A Fusible glass fuse 5x20 mm with an average time of interruption. Rated current 12 A, maximum working voltage 250 V and long life. Glass Fuse 5x20mm, 30A Glass fuse 5x20 mm with an average time of interruption. Rated current 30 A, maximum working voltage 250 V and long life. 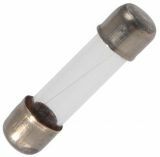 Glass Fuse 5x20mm, 25A Glass fuse 5x20 mm with an average time of interruption. Rated current 25 A, maximum operating voltage 250 V and long life. Glass Fuse 5x20mm, 20A Fusible glass fuse 5x20 mm with an average time of interruption. Rated current 20 A, maximum operating voltage 250 V and long life. Glass Fuse, 0.05A, 5х20mm Glass Fuse 5x20 mm,with rated current 0.05 A and operating voltage max 250 V.
List Price 0.15лв. VAT Incl. 0.10лв. VAT Incl. 0.09лв. VAT Incl. 0.08лв. VAT Incl. Glass Fuse, 0.1 А, 5х20 mm Glass Fuse 5x20 mm,with rated current 0.05 A and operating voltage max 250 V.
List Price 0.15лв. VAT Incl. 0.10лв. VAT Incl. 0.08лв. VAT Incl. 0.07лв. VAT Incl. 0.05лв. VAT Incl. Glass Fuse, 0.16 A, 5х20 mm Fusible Glass Fuse 5x20 mm,with rated current 0.16 A and operating voltage max 250 V.
Glass Fuse, 0.2 A, 5х20 mm Fusible Glass Fuse 5x20 mm,with rated current 0.2 A and operating voltage max 250 V.
List Price 0.08лв. VAT Incl. 0.05лв. VAT Incl. Glass Fuse, 0.25 A, 5х20 mm Fusible Glass Fuse 5x20 mm, with rated current 0.25 A and operating voltage max 250 V.
Slow Blow Glass Fuse, 0.63 A, 5х20 mm Fusible Glass Fuse 5x20 mm, with rated current 0.63 A and operating voltage max 250 V.
List Price 0.25лв. VAT Incl. 0.17лв. VAT Incl. Slow Blow Glass Fuse, 1 A, 5х20 mm Fusible Glass Fuse 5x20 mm,with rated current 1 A and operating voltage max 250 V.
Glass Fuse, 1.25 A, 5х20 mm Fusible Glass Fuse 5x20 mm, with rated current 1.25 A and operating voltage max 250 V.
Glass Fuse, 1.6 A, 5х20 mm Fusible Glass Fuse 5x20 mm,with rated current 1.6 A and operating voltage max 250 V.
Glass Fuse, 5 A, 5х20 mm Fusible Glass Fuse 5x20 mm,with rated current 5 A and operating voltage max 250 V.
Time delay glass fuse 5х20mm, 2А, Slow blow glass fuse 5x20 mm with rated current 2 A and operating voltage max 250 V.
Glass Fuse, 9 A, 5х20 mm Fusible Glass Fuse 5x20 mm,with rated current 9 A and operating voltage max 250 V.
List Price 0.15лв. VAT Incl. 0.10лв. VAT Incl. 0.08лв. VAT Incl. 0.07лв. VAT Incl. 0.06лв. VAT Incl. Glass Fuse, 0.125 А, 5х20 mm Fusible Glass Fuse 5x20 mm,with rated current 0.125 A and operating voltage max 250 V.
List Price 0.15лв. VAT Incl. 0.10лв. VAT Incl. 0.09лв. VAT Incl. 0.08лв. VAT Incl. 0.07лв. VAT Incl. Fuse, glass, 5x20mm, 0.16A Fusible Glass Fuse 5x20 mm,with rated current 0.16 A and operating voltage max 250 V.